In Backroads of Paradise: a Journey to Rediscover Old Florida, Cathy Salustri takes her readers on a 5,000-mile road trip through the state, retracing twenty-one driving tours that were originally described in the 1939 Works Progress Administration publication, Florida: A Guide to the Southernmost State. More than just an updated guide to these driving tours, Salustri’s book is also a memoir, a meditation, a lament for the Florida that was, and an outpouring of love for the “not just one Florida, but many real Floridas” that are. Each chapter of Backroads of Paradise recounts Salustri’s travels along one of the driving tours and compares her observations with the descriptions in the 1939 Guide. By turns comic and poetic, Salustri’s quotable wit and compelling descriptions of Florida’s natural beauty would make the book worth reading even if the material were not so entertaining. Salustri chooses her details well, however, and she demonstrates that Florida provides a fascinating variety of material. Where else could you cuddle with a baby gator and watch real performing mermaids on the same day? Salustri enlivens her account of driving the tour routes with historical anecdotes, such as the unsolved murder of Edgar Watson, Florida’s most famous “stasher of bodies,” and the town of Mount Dora’s unsuccessful attempt to earn fame by painting itself pink. Salustri also includes adventures from her own travels, both in prior years and while retracing the driving tours. I can’t decide which entertained me more: Salustri’s fortunate escape from “death by bird” during a solo camping trip in Lake Kissimmee State Park, or her hair-raising encounter with a family of baby gators while kayaking with her curious dachshund in John B. Sargeant Park. Even when she acknowledges unpleasant realities, Salustri’s enthusiasm for Florida is evident and contagious. I highly recommend Backroads of Paradise to anyone with a connection to Florida or an interest in travel. If you aren’t especially keen to explore Florida before you start reading, you are sure to be intrigued, if not in love, by the time you finish. Florida may be known for its citrus and sunshine, but a rich American history has been built into the land. Rodney Carlisle, professor emeritus of history at Rutgers University, has partnered with Loretta Carlisle, a professional photographer, to explore the many forts dotting the Sunshine State. The unique travel guide, Forts of Florida, is the result. The guidebook's introduction offers a brief overview of the Carlisles' journey and rationale for selecting which forts to include. They visited each fort, by car or boat or on foot, from the northwestern corner to the southernmost Key, snapping photos and digging up as much history as they could along the way. In the end, they settled on twenty-three military sites. "Although in the long history of Florida, at least another one hundred other forts were at one time or another built and occupied in the state...this guidebook focuses on places where original structures, reconstructions, ruins, museums, or visitor centers are there to tell the story." Forts of Florida was organized with the visitor in mind. The sites are categorized according to region: northwest, northeast, central, and south Florida. A chronology of historical battles and other events are included with a glossary to assist readers in navigating the guidebook. Each entry includes not only practical information, such as the location with directions, fees charged, hours of operation, contact information, but also unique facts, must-see highlights, and a condensed history of the battles that took place in that specific area. Forts are cross-referenced in the "Things to See Nearby" sections, with valuable tips. For example, Fort Gadsden, located near Sumatra in the Apalachicola National Forest, is close to both Fort San Marcos de Apalache and Mission San Luis, but the Carlisles note that "the site of Fort Gadsden is extremely isolated, and the long ride to and from it will preclude combining this visit with another for most visitors." Although all the photographs are in black-and-white, they offer an excellent sampling of what visitors should expect to see. In addition to paintings and maps used with permission from the Library of Congress, Loretta Carlisle was able to capture shots of the buildings, monuments, aircraft, live re-enactments, and even some obscure legends such as Robert the Haunted Doll, who some claim to have heard taunting children from an attic window in Key West's East Martello Tower, where he was stored after his owner's childhood. Forts of Florida offers many surprising facts and myths about Florida's historical development, from Timucua Indians, to the "real" first shot of the Civil War, to an underground railroad run solely by Seminoles and freed slaves. Easy to use and fascinating to read, this is a great guidebook for tourists, explorers, and history buffs. Marci Calabretta grew up in Ithaca, NY and is currently earning an MFA at FIU. Her chapbook, Last Train to the Midnight Market, is out from Finishing Line Press. She is the co-founder and managing editor of Print Oriented Bastards and a Contributing Editor at The Florida Book Review. As a native of Pensacola, Florida, I have always used the term “Redneck Riviera” with pride. It think of it as a “folksy” way to describe a region that has all the natural beauty of some of the world’s most famous stretches of beach and yet preserves a laid-back attitude and special tranquility that those places so often lack. Brian R. Rucker clearly feels much the same, and his guidebook Treasures of the Panhandle: A Journey through West Florida paints a wonderful picture of a region where gorgeous beaches and peaceful forests merge with a rich preserved history to create a place like no other. As a region, West Florida is often seen as nothing more than a piney woods wasteland with no notable cities, a place of Cracker farmers, of sparsely populated forests and swamps, and a desolate stretch of Interstate 10 between Tallahassee and Pensacola…This book was inspired by the fact that while the panhandle is so often forgotten, West Florida contains some of the state’s most historic sites and most unspoiled natural resources. Following this purposeful introduction, Rucker organizes his book by the region’s counties, starting in Escambia County and moving eastward. The history and sights both natural and manmade of these counties are conveyed in thorough detail, and the book achieves an effortless blend of historical account and location-focused travelogue that makes these often overlooked parts of the country seem like ideal visiting locales both for vacationers and for people native to the area (this reviewer included). For instance, Pensacola’s four-century-long history as a lumber yard for numerous empires, a robust harbor, and Civil War flashpoint is connected to the places where visitors can see this history come alive, like the T.T. Wentworth Jr. Florida State Museum and the still-standing Fork Barrancas, which may be the real starting place of the Civil War. The best-preserved of these forts is Fort Barrancas, perched atop a bluff overlooking the pass to Pensacola Bay. Before the present-day fort was constructed, this area was the site of the permanent Spanish settlement in the Pensacola area, Presido Santa Maria de Galve, which was in operation from 1698 to1719…Some believe that the few shots Union soldiers in January 1861 at noisy southerners threatening the fort may in fact have been the first shots of the Civil War. Rucker gives plenty of attention to the stunning natural beauty of the Panhandle as well. In addition to lauding the white-sand beaches that stretch across the region’s coast along the Gulf of Mexico, he draws attention to beautiful inland locales like the Blackwater River State Forest (in which I spent many a lazy Saturday tubing down the crystal-clear river), Cypress Springs, and the underground splendor of Florida Caverns State Park. The abundance and diversity of the inviting destinations he includes might make would-be travelers rethink a mere weekend trip to the region; they might want to make it a month. Included in the book are many photographs, both color and black and white, that capture the history and beauty of the Panhandle. These photographs lend a potent visual attraction to the sights that Rucker lovingly details in his prose. A lengthy appendix of historical register sites and markers as well as historical and ecological resource listings give the reader a wealth of contact information that can make selecting and finding your destinations much easier. I admit a certain bias in favor of a guidebook that covers my home region in such a thorough and passionate manner. It's true, I also want the best for that region. And Treasures of the Panhandle is an enjoyable and informative guide that effectively reveals the history and beauty of a part of the state that is so often overlooked. Armchair outdoor enthusiasts, prepare for a twinge of guilt as you tuck into Johnny Molloy’s Hiking the Florida Trail. Molloy’s unfettered zeal for the 1100 miles of open trail unleashes that little “why don’t I take time to do this?” voice in the back of your head. That skosh of guilt is the only unpleasant aspect of this book. Molloy weaves a tale of high adventure at a pedestrian pace, crafting a pleasing combination of personal journal and travelogue. Molloy is an expert hiker, but his irreverent tone averts haughtiness. Where the technical aspects of an arduous hike could bog the story down, Molloy dispenses tongue-in-cheek humor at his own foibles. Chapters such as “How to Turn an Easy Day into a Hard One” relate how even the savviest outdoor traveler can go wrong. From unintended detours because “real men are too embarrassed to ask for directions, especially hiking directions” to squeezing through a too-tight fence and unknowingly leaving his sleeping bag snagged behind him, Molloy can share a joke on himself. Molloy offers insight into the environmental challenges of the heavy urbanization of Florida. He highlights efforts to right environmental manmade wrongs. [Later] The FT moved closer to the Kissimmee, which at this point was no longer canalized, but back to what it used to be like. I walked the edge of the river prairie. …Palm islands rose from the marsh. Distant flocks of wading birds fed in the shallows, then all exploded into the sky at once for reasons unknown to me. His narrative paints the changes. He provides a testament to the benefits of preserving nature, but avoids pontificating. Pull up your armchair, hunker down for a good read and just maybe you’ll also find the inspiration to pull those hiking boots from the dark corner of your closet and hit the Florida Trail yourself. Gwen Keenan is a budding freelance writer and retired Coast Guard commander. She lives in Tallahassee with her husband and their four young children. I was nine years old the first time my dad brought me to Walt Disney World. I imagined a baby-blue gown swishing around my delicate glass slippers as I approached Cinderella’s castle. There were shrubs trimmed into shapes of animals. And the rides—It’s a Small World, The Haunted Mansion, and the Big Thunder Mountain Railroad. The gift shops were full of plush little Mickeys, Mickey watches, black felt Mickey hats with big Mickey ears, Mickey t-shirts, Mickey sunglasses. Woo hoo! I wonder, though, what the experience was like for my Dad. First, there was the money he had to shell out to get us in the park. The long lines. The burgers for $2.50—pretty pricey for late-1970-something. And the price of the hotel room. And what was it like for him to sit through a twenty-minute boat ride watching a bunch of dolls sing? How did he stand the Country Bear Jamboree show? Years later, I cringe when I think of the money he must have spent on that trip and the glances he must have exchanged with other parents over the heads of us little ones behaving like we were on Speed, but it was truly a magical experience for me. Since that time, Disney has expanded tremendously. Not only is there the Magic Kingdom, but also Epcot Center, Disney’s Animal Kingdom, Pleasure Island and Disney’s Hollywood Studios. It’s no longer one day full of adventures, but several days’ worth. And the lines are longer and the prices are higher. So if you’re going to bring your kids, why not go in with a plan? 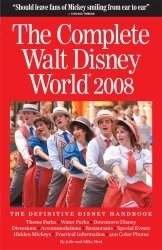 Julie and Mike Neal have written The Complete Walt Disney World 2008: The Definitive Disney Handbook to help parents of 2008. The Neals are undeniably Disney experts—they’ve visited the park over 800 times. The book covers all the attractions and rides in the parks, giving for each a description, color photos, the approximate waiting time at various times of the day, capacity, ADA access and a “fear factor” for little children. The Neals include listings of all the restaurants at the parks, with a price range, menu offerings and that even offer a detailed description of the ambience. At the San Angel Inn at Epcot, for example, you can enjoy a “candlelit table” and “moonlit courtyard” as you listen to mariachis. A complete listing of the parks’ hotels specifies room sizes, amenities and price range. There are some surprisingly good deals—rooms at the All-Star resorts, right on the edge of the Disney property range from $82-141 for standard rooms, and $179-285 for suites. Not sure how to schedule your day? The Neals offer several daily schedule suggestions for each park, right down to a restaurant recommendation for lunch and dinner. They also list times of the year when the park is less crowded, what to pack, and information about package deals and special events. The book is sprinkled with “Fun Facts:” Walt Disney’s parents grew oranges and ran a hotel near Kissimmee. Baffled locals speculated about what was being built on the land in the 1960’s because Walt Disney called the park “Project X.” The park is twice the size of Manhattan. The Cinderella story originated in 9th century China. The Complete Walt Disney World includes maps, a useful phone listing, tips about childcare and parking, and an index so you can locate things quickly. The authors advise that while you may be tempted to stay in your hotel room and watch TV when it rains, those are the days with the shortest lines, and there are umbrellas and rain ponchos available at most of the gift shops. And a final helpful note to parents—if things get rough running around the parks in the Florida heat with a bunch of little ones, you can pick up a nice, cool margarita in Epcot’s Mexico Pavillion or a tall, cold beer at Disney’s own microbrewery, The Big River Grill and Brewing Works. Susan Parsons is publisher of the Florida Book Review. Beyond the sandy coastline and vast swampland, an elaborate network of tea- and rust-colored rivers vein Florida's coastal plains, cypress swamps, and hardwood hammocks, supporting a number of complex ecosystems as well as serving as a source of legend, history and nostalgia. In his book Florida Rivers, Charles R. Boning, naturalist and modern-day explorer, provides the reader with a comprehensive coverage and detailed profile of Florida's 60 most significant waterways. The book functions both as an overview of the geographic and geological components of the rivers and as a field guide for nature enthusiasts and adventure seekers alike. The first part of the book encapsulates the forces affecting the river systems and examines the rivers in their natural environment as well as within a human context. Superbly organized, this section delineates the geological history, surface water features, different types of rivers, and the biological components of the rivers. It also contains a chapter on the conditions of the rivers, explaining how a burgeoning population—from 1818 when Spain ceded Florida to the US up until present—has contributed to the physical modifications of the rivers and to the degradation of the water quality. Though the damage created by conceptually flawed projects (such as the Cross Florida Bridge Canal), pollution from urban runoff, industrial waste and domestic wastewater is devastating to the health of the rivers, the author stresses that the rivers are resilient and there is hope for revival. This section concludes with a chapter devoted to what is now being done to preserve Florida's rivers on both public and private levels, including what we can do to safeguard the water quality. I found the prose in this part of the book, though very informative, to be rather dry and lackluster, reminding me of an eighth grade earth science textbook. Even fresh new colored highlighters could not make sentences like, "people require water for survival and must have access to an adequate supply" seem less prosaic. I couldn't help but think, "If only Boning had Annie Dillard as an editor. She would know what to do with words like gumbo limbo, cocoplum and bigmouth sleeper." With his overview out of the way, Boning devotes most of the book to profiling the major rivers within eight different regional sections of the state, and, I must say, does so quite effectively. Each river gets a detailed map, a text box summary explaining its type, the material lining the riverbed, and its ecological condition. The author gives a concise overview of the geography and hydrology, history, human inpact, recreational activities, and flora and fauna. Although I did find the recreational activities sections to be a bit redundant (I mean, what else is there to do on a river besides boating, camping and fishing? Snowshoeing? ), the second part of the book provides the reader with everything you would expect from a competent field guide, including more than two hundred glossy, colored photographs of the waterways, fish and wildlife. I was fascinated to discover just how diverse Florida's rivers really are. While some rivers meander through sandhills and under canopies of Juniper, pine and magnolia, others flow through formidable gorges, drop over rocky shoals or disappear into sinkholes. Every river, tributary and creek also has its own unique history, whether it be where Davy Crockett fought the Creek warriors, where the bloody battle of Olustee took place, or where the Spanish slaughtered French Huguenots. However, no history is as compelling or as strongly felt as that belonging to the Native Americans. Even the names of the rivers-Apalachicola, Caloosahatchee, Withlacoochee-evoke images of Indian tribesmen canoeing downstream between large doffing elephant ears, speaking their now-forgotten languages. Not only will readers of this book discover more about the wildlife, superb natural beauty and recreational opportunities that Florida's rivers have to offer, but they will also learn more about the state's rich cultural heritage. Jennifer Hearn is an MFA student at Florida International University. She loves rivers and would snowshoe down them if she could. All right, I’ll admit it. When Lynne Barrett asked me to review this “insider’s guide” to the Keys, my first thought was: “How can this possibly compare to Joy Williams’ classic The Florida Keys: A History and Guide?” I’m sure that any writer working on a Keys travel book must expect the inevitable comparison. But then I read that author Nancy Toppino lives and writes in Key West. Hmmm, I thought, let’s give this a chance. Then I leafed through several pages of lovely color photos capturing various aspects of the island. Finally, I read her warm, charming and heartfelt preface and I was hooked. Where Joy Williams’ book is as casual, breezy and laid-back as Key West itself, this Insider’s Guide goes into considerably more depth. And just like the Williams book, it’s well written and by turns serious and amusing. I believe that it’s a must that any book that talks about Key West not take itself too seriously, and this one succeeds. The depth of information is hard to beat as well — Ms. Toppino talks about neighborhoods, real estate, education, childcare and much more, in addition to the expected information about restaurants, lodging and entertainment. I’ll dock her a few points for not mentioning the El Patio Motel, my personal favorite place to stay in Key West, but maybe she can feature it in next year’s guide. It’s a packed full of useful information, but also has fun stuff such as “The Gee-Whiz Sunset Rating Chart”! I think if I were traveling to the Keys for the first time, this is the book I would have to have. It’s hard to imagine anything more comprehensive, and unlike other guidebooks, it’s quite well written. Bravo, Nancy Toppino! Harry Calhoun is a widely-published writer of articles, literary essays, and poems. He has recent publications in Chiron Review and poetry forthcoming in Abbey, Word Catalyst and LiteraryMary, and writes a wine column, Ten Dollar Tastings. As an avid horseback rider since age twelve, I have explored many of South Florida’s horseback trails. However, I have never had the opportunity to go riding in Northern Florida, so I read Cornelia Bernard Henderson’s book, Florida on Horseback: A Trailrider’s Guide to the North and Panhandle Regions, with interest. Henderson’s guide offers horseback riders information about 112 trails in the Northern and Panhandle regions of Florida. In the beginning of the book Henderson provides a list of icons she uses to describe the amenities available at each trail she directs you to. For instance, a tent shows if there’s a campsite, a tree indicates there is a shady area to rest, and a water spigot lets you know there is water for you and your horse. Henderson then describes some of the dangers of Florida trail riding and discusses what you need to take with you. She suggests keeping an eye out for fire ants, alligators, and being extra careful when bringing any dogs with you. She reminds you to pack five gallons of water per horse, hay, a haynet and fly spray for those areas of Florida where bugs can really bother your horse. In one of her most practical suggestions Henderson writes, “Sudden rains in Florida can leave you soaked to the skin. We’ve learned the advisability of keeping an extra polo shirt, sweat shirt, and loose-fitting pair of jeans and an inexpensive rain slicker in a storage box in the peak of our trailer.” The book is filled with many other little reminders that could make a huge difference on your trip, such as looking at a map of the trail before you embark, and carrying a compass in case you become disoriented. Overall, I was very pleased with the amount of information provided in Florida on Horseback, and the knowledge Cornelia Bernard Henderson showed about trail riding. I would recommend this book to any of my equine loving friends. Lauren Buck is a student at Florida International University majoring in Hospitality Management. Florida’s Living Beaches is more than just a reference book for the savvy beachcomber. Within the glossy, colorful pages of this field guide, there are 985 images, 431 maps and 822 descriptive accounts that reveal the most esoteric secrets of Florida’s coastline without ever spoiling the reader’s initial intrigue. Blair and Dawn Witherington provide evidence that the beaches are, in fact, alive. Of the 12000 miles of Florida coastline, almost 700 are sandy beaches where starfish lurch in the low tides, bioluminescence dazzles in the wrack lines, and ospreys spread their narrow wings and glide over the shoreline. The book not only illustrates and explains why the beaches are pulsating with life, but it also shows how humans interface with it. Florida’s Living Beaches explores the connection between sea, land and man in five sections: Beach Features, Beach Animals, Beach Plants, Beach Minerals and Hand of Man. Each page identifies a specific charm of the living beach, describes its function, reveals its whereabouts and seasonal appearances, from Santa Rosa Island to Fort Clinch, and includes some interesting facts under the heading “Did you Know?” For example, did you know that tropical almonds have a sedative and aphrodisiac effect . . . on rats? In Beach Features, the Witheringtons detail the anatomy of the wave, demystify the relation between celestial gravity and the tides, and explain how to find the wavelength between sand ripples. The reader learns that the variety of tea, turquoise and mint-green colored waters (which could tempt anyone to collect them in Mason jars) is actually a result of turbidity and algae. The section also examines the Gulf’s most enigmatic and infrequent phenomenon: the green flash. The reader follows the tracks and burrows of elusive creatures in Beach Animals, and also discovers the distinguishing features of oceanic drifters such as moon jellies and blue buttons. Here the reader takes a closer look at the volutes and whorls of snails, the beaks and plumes of birds, and the identifying features of both land and marine mammals. Blooming or sprawling over the sand dunes and the open beach are fuchsia flowers, perennial spiderlilies, glossy leafed seaside joy and the sinuous vines of the beach morning glories. The Beach Plants section, however, points out that we never see the most enchanting vegetation in its entirety, only in its globe-drifting parts. The section discloses where to find the sea-sculpted driftwood and where you can go to fill your pockets with bright red sea beans. Crushed quartz make up most of the beaches’ sand, but also scatted about are fossils, and seashell granola, which provide evidence of former marine and land life. Detailed description and up-close photographs of sand, stones and fossils are all included in the Beach Minerals section. The reader learns that because the peninsula is so young, Florida does not have any dinosaur remnants. But perhaps on a calm day during a fossil scavenge, you can be lucky enough to find the robust, triangular tooth of the white shark that existed thousands of years ago. Jennifer Hearn lives in Miami where she writes about nature and traveling. She grew up in the Caribbean and knows all about the anatomy of a wave. If you thought the Garden of Eden was somewhere in the Middle East, forget it. It was in Bristol, Florida. . . according to the late Elvy E. Callaway, a Baptist preacher in the 1950s. Callaway studied the area for fifty or more years and discovered a number of features that match the Bible's description of the Garden of Eden. He pointed out that Genesis 2:10 states that “a river went out of Eden to water the garden; and from hence it was parted, and became into four heads.” That sounds exactly like the Apalachicola River, which splits into four rivers. The reverend claimed that only two rivers in the world fit this description: one in Siberia, and the Apalachicola. We doubt that Eden was in Siberia; it's too cold there. . . Of course, one might point out the absence of apple trees and demand to know where Eve got the apple she ate. But advocates of the Garden of Eden theory point out that Genesis makes no mention of an apple. That's right – Eve ate from the tree of knowledge, and we're sure it's growing somewhere around Bristol. But not all of Florida is as heavenly. Weird Florida: Your Travel Guide to Florida's Local Legends and Best Kept Secrets also tells of the Devil's Millhopper, a huge funnel-shaped sinkhole northwest of Gainesville. The book offers several stories about the hole, each ending with someone (a sinner/ a wagonload of cotton and its driver/ a beautiful Native American princess) falling in and never being seen again. Weird Florida describes some of the more famous weird locations in Florida, e.g. Coral Castle and the Miami Circle, but the reader can still learn, for instance, several possible reasons for the Miami Circle's existence, ranging from the standard idea that it's the foundation of a Tequesta home to the critical view that it's merely the remains of a septic tank. One interesting idea, reinforced by the fact that non-local items made from copper, galena and basalt were found at the site, is that it was a Mayan trading post or observatory. Fortunately, the book does not rely primarily on these letters. In a section on the Wakulla Volcano, a strange column of smoke that rose from the Wacissa Swamp southeast of Tallahassee intermittently for hundreds of years, Weird Florida uses both A Tallahassee Girl, an 1881 book from the area, and Tallahassee Patriot and New York Herald Tribune articles from the 1880s as sources. The smoke was explained as coming from a camp of runaway slaves or Civil War deserters, but “each new theory seemed to ignore the fact that the smoke had been seen for at least a hundred years.” Those who wish to see the smoke now are out of luck – it abruptly stopped on August 31, 1886, when an earthquake struck Charleston, South Carolina. A few years ago, I visited Kingsley Plantation, on Fort George Island near Jacksonville, with a school group. We took the tour, visiting both the plantation house and the former slave shacks on the other side of the property. One thing I didn’t learn till I read Weird Florida, though, was that Kingsley Plantation is haunted by not just one, but three ghosts: a child who lives in the slaves' well (the well has been covered, and the ghost is no longer seen or heard); a woman, rumored to be the plantation-owner's wife, who only appears in photographs taken on the home's extensive front porch; and a man with red eyes who chases cars on the road at night, the only malevolent ghost. The Timucuan Ecological and Historical Preserve, which operates the plantation, does not mention the ghosts on its website. In addition to other phantoms ranging from a ghost horse to a ghost motorcyclist, Weird Florida describes other paranormal activities in the state. Florida has its fair share of UFO sightings, but for those with a fear of aliens, it's actually a great place to live – the book makes no mention of a single alien abduction or even contact. The author puts forward the theory that because of Florida's distinctive shape, it's easy to spot from space, so aliens use it as a “transit point” before going to their final destinations elsewhere. Florida's aliens are fashionable beings: during the 1960s, sightings abruptly switched from the traditional saucers to more modern and stylish triangle- and boomerang-shaped craft. Not all of the book is out-of-this-world, though. It details famous historical people from Florida, ranging from business tycoons like Henry Flagler to swashbuckling pirates on the Gulf Coast to notable gangsters like the members of the “Notorious Ashley Gang,” backed by a woman named Laura Upthegrove but more commonly known as “Queen of the Everglades.” Ms. Upthegrove later moved into a more reputable job as a gas station attendant. It describes various roadside oddities. Did you know that Florida is home to both the smallest post office and the smallest police station in the world? And does this say something about our public services? This book is an interesting and enjoyable read, and it's highly recommended for all Floridians or travelers to the state. It's a good read for non-natives who want to impress their native Floridian friends at cocktail parties. But remember this warning: take everything with a grain of salt. And a glass of orange juice.